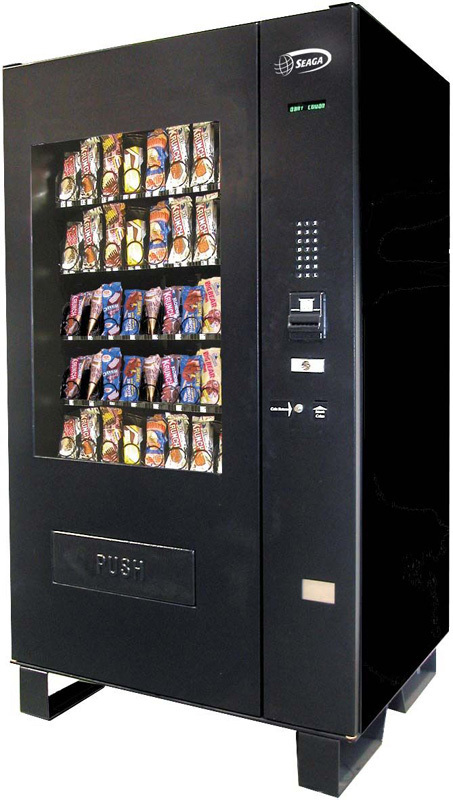 The VC-1100 Ice Cream vending machine is the result of customizing the standard VC-1100 to hold an extra large capacity of ice cream bars. This attractive vendor will turn heads and is sure to be a hit. * Vends Cold / Frozen Foods and Ice Cream. * Temperature Adjustable From -20° F to 40° F.
* Triple Pane, Heated Glass Eliminates Condensation and Frost. 72" H x 41" W x 32" D - 780 lbs. Does this machine come with a lock installed? Yes, all of the machines we carry come with a installed lock and 2 keys. Additional keys may be ordered at any time though the manufacturer's parts department. Will this machine accept the new and old style bills? Yes, all of the machines we carry accept both the new and old style bills. By adjusting the dip switches on the bill acceptor, you may turn on/off the acceptance of the following bills: $1's, $2's, $5's, $10's & $20's. Upgrade options are availble if you would like to accept bills larger than $20.